Batman’s high-powered vehicle has taken many forms since its first appearance in 1939. But the first car to grab the public’s imagination and KAPOW! it was the 1955 Lincoln Futura, modded for the 1966-1968 television show to suit the world’s greatest detective. The Batmobile made an even greater impression on fan Rick Champagne. So when the vehicle came up for auction on January 19, 2013, he purchased it…for $4.2 million. The TV car was built from the 1955 Lincoln Futura concept car, which [creator George] Barris had purchased years earlier from Ford for $1. 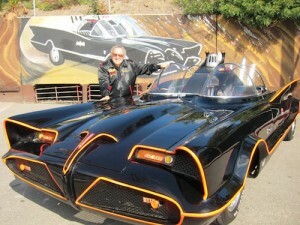 After the TV show ended in 1968, Barris kept the Batmobile, storing it at his north Hollywood custom-car shop and trailering it to auto events nationwide. This was the first time the Batmobile was ever put up for sale. Champagne owns Champagne Logistics, which specializes in transportation services. But the Batmobile will not become part of his fleet: He plans on keeping his purchase in his living room in stately Champagne manor. Your living room and not your Batcave? Champagne, you disappoint me. You disappoint us all. Trivia note: Although the Batmobile first appeared in 1939, the name “Batmobile” wasn’t coined until 1941. This entry was posted in Diecast Car Models, Hobbies and Toys and tagged Collectibles, diecast car models, Franklin Mint Diecast Car Models, Hobbies and Toys, replica cars. Bookmark the permalink.